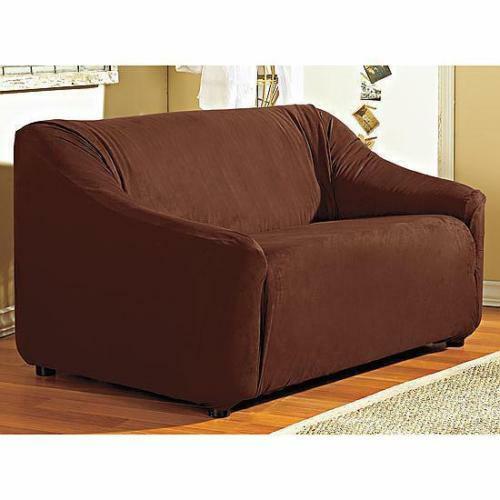 NEW Stretchable Sueded Chocolate Loveseat Slipcover NEW Stretchable Sueded Chocolate Loveseat Slipcover. This Stretchable Sueded Slipcover slides easily onto your furniture, conforms to its shape and stays in place for a sleek, custom look. The stretchable material hugs your furniture for a clean look without the extra material and ties of other slipcovers. Soft sueded construction adds a luxurious look and feel to your living room. Stretches up to 30% for a perfect fit. Fits loveseat up to 72 inches. Made of 100% polyester. Machine care. Brand new, never used. Payment and Shipping: I accept all major credit cards through PayPal. Please DO NOT send personal checks. Shipping Charges is 8.95 for priority shipping in the USA. I will ship to the USA and world wide through USPS. I ship within 24 hours after receiving payment using delivery confirmation. Please feel free to ask questions aboutsale prior to its ending. I know you will love my items and my service. If you are not satisfied for any reason, please let me know so that I may work with you to make you happy. Please visit my current sales at Bonanza and save on S H with multiple orders. Thanks for your bid! Pay me securely with any major credit card through PayPal!